HTC may be eying the jumbo smartphone market with the HTC Holiday, an Android phone with a 4.5-inch screen. 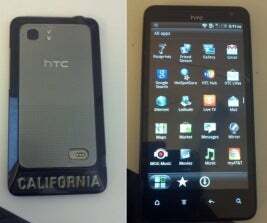 Photos and specs for the HTC Holiday leaked to the XDA Developers forums, showing a simple touch screen slab with a 1.2 GHz dual-core processor, 1 GB of RAM, an 8-megapixel rear-facing camera, and a 1.3-megapixel front-facing camera. The 4.5-inch qHD display has a rumored resolution of 960 by 540. As Slashgear notes, the back panel looks like it may support a conductive charger, kind of like the Touchstone dock on HP's WebOS devices. It's not clear which version of Android the HTC Holiday will run. AT&T may be the carrier, as suggested by the "myAT&T" app in one of the leaked photos. More than a year ago, HTC pushed smartphone sizes higher with the HTC Evo 4G, which at the time was the first Android smartphone with a 4.3-inch display. Motorola soon followed with the Droid X, and now 4.3-inch screens are typical among high-end handsets. The Holiday would help push the size barrier even higher, though it wouldn't be the first 4.5-inch Android smartphone to market. Earlier this year, AT&T launched the Samsung Infuse 4G, which earned praise for its slim design and media playback capabilities, but suffered from jagged text and pixelated images. AT&T must be pleased with the Infuse's performance if the carrier is preparing another huge smartphone with even beefier specs. Meanwhile, T-Mobile is rumored to be planning its own 4.5-inch Android phone, the Samsung Hercules. It's a trend in the making. Now all we need are pants with larger pockets.